The LADARVision® system, manufactured by Alcon, is proven to deliver customized LASIK results, which traditional LASIK can't match. The LADARWave® wavefront device lets your doctor create a three-dimensional map of your unique visual distortions. Powered by technology designed for NASA, the LADARVision® system eye tracking device ensures accurate placement of the small-spot laser beam. The LADARVision® excimer laser precisely removes targeted tissue and reshapes your cornea. Together, these devices bring you the CustomCornea® difference. The goal of the CustomCornea® LASIK process is to give you better visual quality than traditional laser vision treatment, eyeglasses, or contact lenses by improving your vision and your lifestyle. Although the success of your LASIK eye surgery is largely dependent on the skill of the LASIK eye surgeon, it can also depend on the quality of the laser technology used. 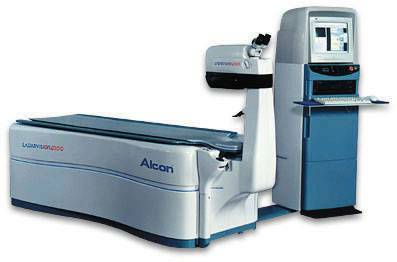 During your vision correction surgery, your doctor will use an excimer laser to reshape your cornea. The smaller and more precise the laser beam, the more precisely your surgeon can reshape your eye's cornea. Not all excimer laser systems are created equal. The beams of light they produce can vary considerably, both in their shape, size, and nature. The LADARVision® system uses a flying small-spot laser beam that's just 0.8mm wide. So it is capable of removing your corneal tissue in very small or "subtle" increments, in both traditional and CustomCornea® treatments. One of the challenges in laser vision correction is that your eyes are never perfectly still. Although you will be asked to focus on a blinking light for the duration of your procedure, your eyes can move as much as 50 times a second without you being aware of it - or able to control it. The LADARVision® system offers an innovative device to keep up with your eye movements, compensate for them, and direct the laser beam to the correct spot on your cornea. Some laser systems have no eye tracking devices at all, or if they do, the eye tracker may not be fast enough to compensate for your involuntary eye movements. When you compare laser technology systems, you'll see that the LADARVision® system has a laser eye tracking device with demonstrated ability to improve the accuracy with which the laser reshapes your cornea. The autonomous laser in our San Leandro office uses Wavefront Technology and LADARVision to track the eye. LADARVision tracking technology was originally developed by the military for missile defense but now stands as the fastest tracking system for an excimer laser at 4,000 samples per second. It is capable of tracking almost any patient including patients with nystagmus or wandering eyes. It uses a "flying spot" excimer laser that uses a small beam of energy in many different locations to create an extremely smooth surface. It has the ability to create an optical zone of 9.0 mm, the largest of any laser currently available. This laser can dramatically reduce the incidence of glare, halos and night vision difficulty. In fact, it has eliminated them in some patients that had these symptoms before surgery. The laser does require pre-op photographs and dilation. Your doctor will choose the laser that both suits your specific needs and yields the best result possible in a safe and FDA approved manner.